Yambol is situated on the eastern part of the Gorno Thracian lowland on the two banks of the Tundzha River, 304 km east of Sofia. History: The earliest remains of settlements in the region were found in the numerous prehistoric village mounds. Two of them, Rasheva and Marcheva are situated in the borders of the town and date back to the neolith period. Findings from them are preserved in the Yambol Historical Museum, the Archeological museum in Sofia and the Louver Museum in Paris. The ancient town emerges as a big Thracian settlement on an important crossroad called Kabile. Later the Romans fortify the town and name it Diospolis. 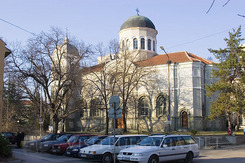 The Medieval Greek name of the town is Dampolis, and the Bulgarian- Dubilin. Yambol is among the towns that first stand against the Muslim invaders, but after a furious siege is captured in 1373. The Revival period marks the development of crafts and trade, and the citizens of the town were preparing for educational and revolutionary activity. Sightseeings: The “st. George church” was built in 1737 and was a cultural- religious centre and the national struggle for the citizens of Yambol. In 1805 a school opened doors in the church. During the Russian- Turkish war the temple was completely destroyed. The Yambol Bezisten is one of the most interesting and well preserved architectural monuments in Bulgaria from the XVth century. It is an indoor market. 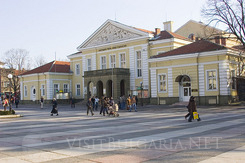 In 1973 the restoration of the market was completed and is now a souvenir palace. More than 100 000 exponents are preserved in the City Historical Museum. Arcitecturala nad cultural sightseeing in the town is also Eski Mosque. There are also an astronomic observatory and a planetarium. The town’s park (an isle on the Tundzha River) is also an interesting place to visit when coming to Yambol. The archeological reserve Kabile is just 6 km away from the town. A great site for relax and tourism is Ormana forest and the low mountain district Bakadjitsite. Wine and dine: Many small restaurants and pubs offer great entertainment and delicious cuisine for the visitors of Yambol. If you need to book accommodation or need more information on Yambol, please check out or list of hotels.